I'm part of WebsiteSetup Web Developers Team. As you know, this site is all about how to make a website. You can learn different ways using either WordPress, Joomla or Drupal. We even have a guide on using pure HTML like in the old days (obviously with HTML5, the latest version). 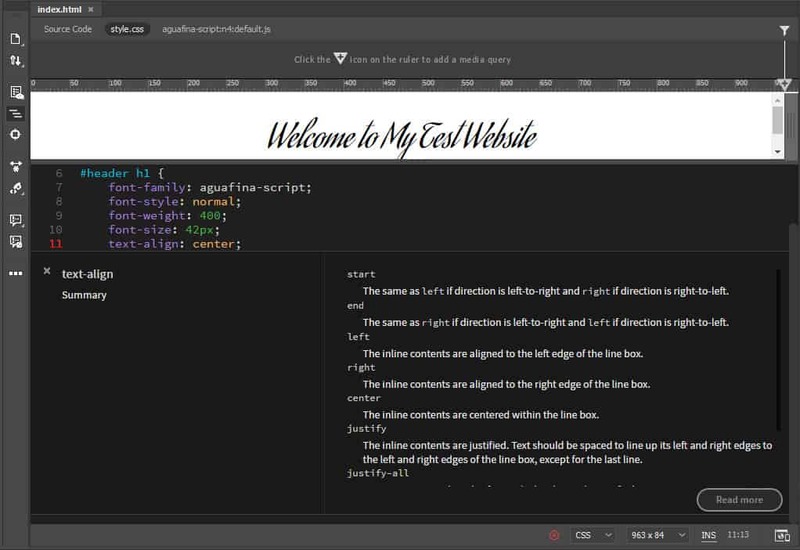 In this Dreamweaver tutorial for beginners, you will learn another one. 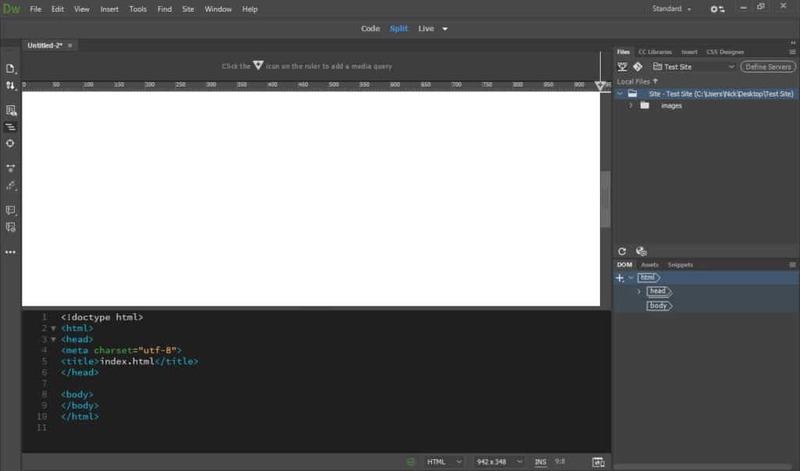 For those who don’t know, Dreamweaver is an application that lets you design, code and manage websites. What is interesting about Dreamweaver is that it offers both the possibility to write code as well as make a website using a visual interface. 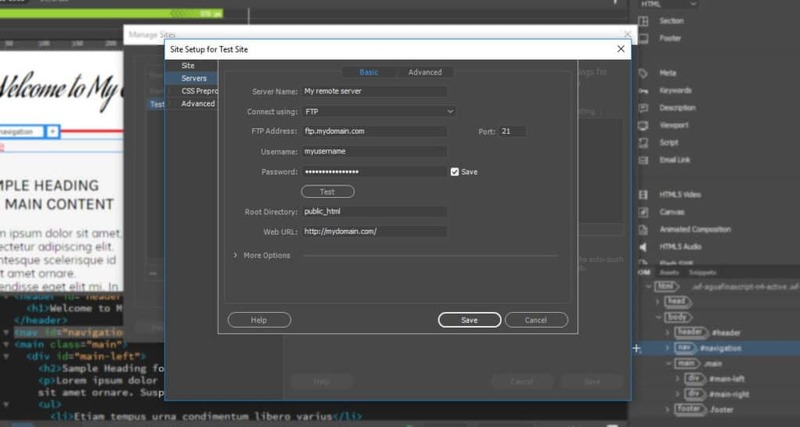 In this Dreamweaver tutorial, you will learn everything you need to know to start creating websites with Dreamweaver. You will get to know the program and what it can do, feature highlights and how to set it up. After that, you will find a step-by-step guide on how to create a simple website with Dreamweaver, make it mobile friendly and then upload it to your server. This will be a long ride. However, you will be amazed at how quickly you will get into this very intuitive program. 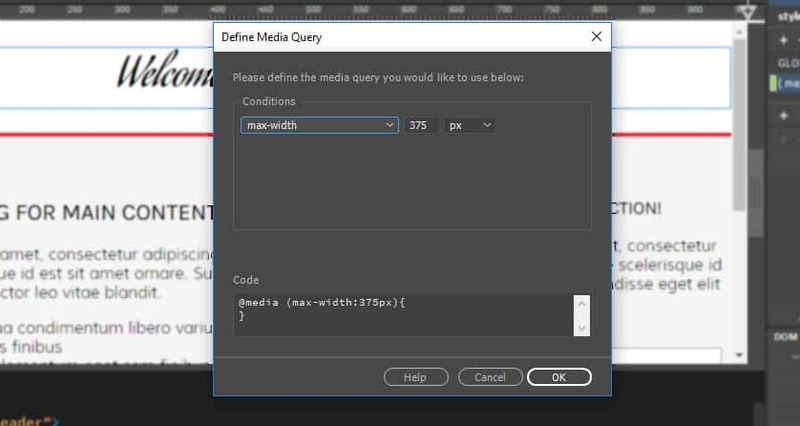 What is Dreamweaver and What Can It Do? 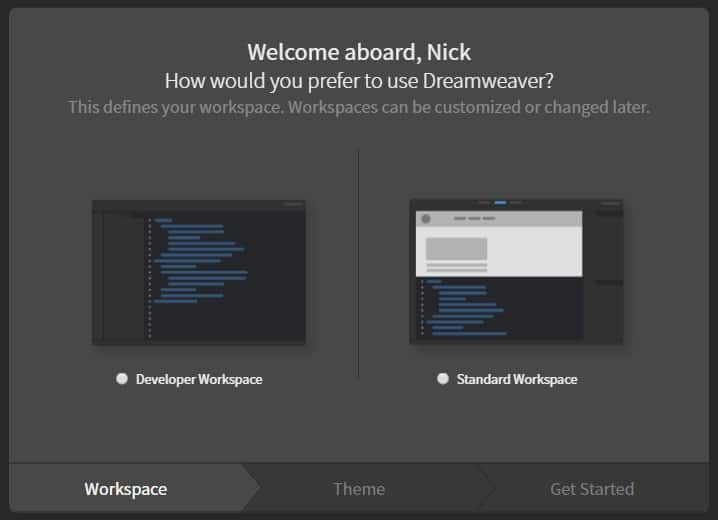 On the surface, Dreamweaver is an IDE (integrated development environment). That means it’s a piece of software that combines different tools to make web design and development easier. 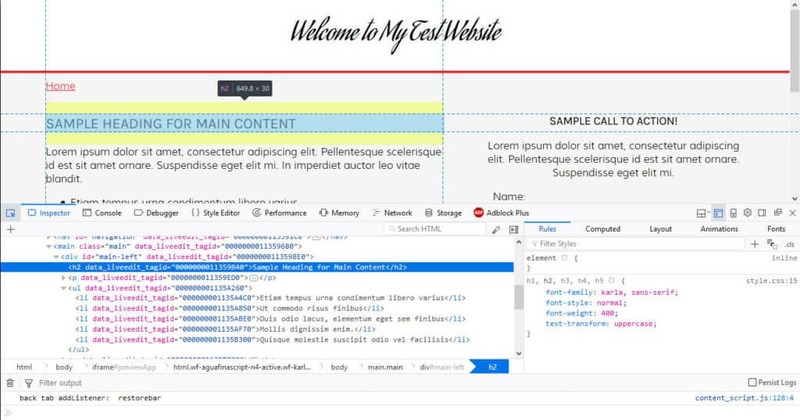 What makes it special is that it is somewhere between a CMS (where you control everything about your website through a visual interface) and a pure code editor. Here’s how the different parts work. 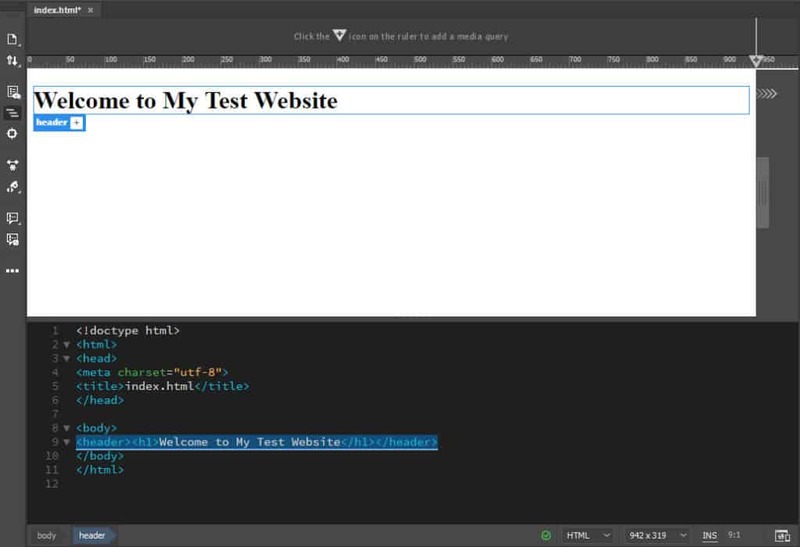 The visual design toolbox basically lets you build websites with your mouse. It allows you to place website elements the way you create a layout in Word. Basically, you see your website as you would see in a browser but also have the ability to manipulate it. This is very useful because it allows you to build the skeleton of a website quickly and without the need to write a single line of code. Instead, Dreamweaver will automatically create the necessary code for you. That way, theoretically, you can put together an entire website by hand and upload it to your server. On the other hand, if you are capable of coding, Dreamweaver has all the necessary tools for that too. Syntax highlighting — That means Dreamweaver highlights different elements (such as operators, variables, etc.) in different colors in order to make the code easier to read and correct. Code completion — Code completion works in a similar way as autocomplete on your phone. Start typing and the editor will make suggestions for what you are trying to write. That way, you don’t have to type everything out completely. Code collapsing — Code collapsing is another feature for making code easier to read. It allows you to visually shrink parts of your code when you don’t need them. That way, you don’t have to scroll through the entire file but can only deal with the parts you need to work on. The best part: if you change anything in your code, Dreamweaver will automatically display it on the visual side as well. That way, you can see it without having to upload your files to a server or fire up the browser. There are a lot more features and you will see many of them in action in the upcoming Dreamweaver tutorial for beginners. As a first step, you need to acquire Dreamweaver from the official Adobe website. As part of Creative Cloud, it costs $19,99/month on a yearly plan or $29,99/month with a monthly subscription. Dreamweaver is also part of their All Apps plan that costs $49,99 per month. Other plans for businesses, teams, students, teachers and schools exist. 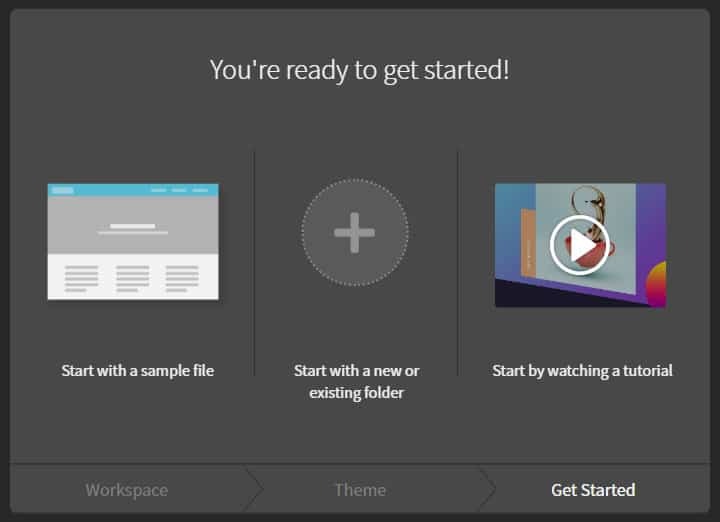 You can get a free trial here or from your Creative Cloud client. When you get the program from the official website, just download the installation file, execute it and follow the instructions. If you are already using Creative Cloud (as I am), you can simply click Try inside the client. Then, when the program is done installing, click Start Trial. When you first start Dreamweaver, you will see this screen. If you have never used the program before, choose No, I’m new. When you do, Dreamweaver leads you through a setup wizard. The first step is to choose whether to use the workspace for developers or a standard workspace. 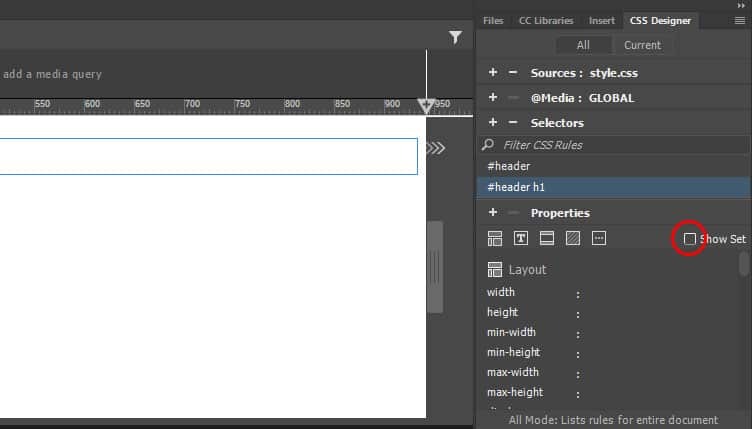 Since this is a Dreamweaver beginner tutorial, choose the standard version. 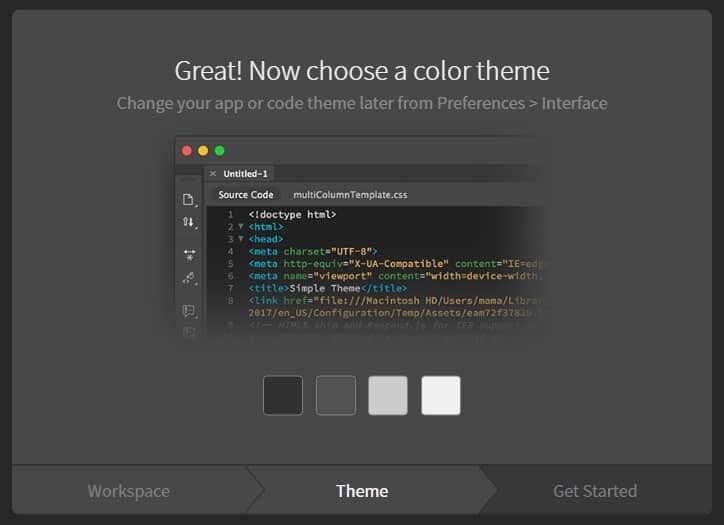 After that, you can pick a color theme for your workspace from four different options. The final step is choosing whether to start with a sample file, new or existing project or watch a tutorial. Choose to start with a new or existing folder and you are done with the setup process. Good job! Now let’s start a project and learn how to create a website with Dreamweaver. Now we are getting to the heart of this Dreamweaver tutorial. The first step is to give your site a name. Then, you need to choose where to save it. This is up to you, but it usually makes sense to keep all projects in one place for the simplicity. You also have the possibility to associate your new project with a Git repository. This can be a good idea since it gives you version control but you can skip it for now. We will deal with everything under Servers on the left side later. Same with CSS Preprocessors, which is only important when you use that kind of thing. What is important to us is Local Info under Advanced Settings. Be sure to click on the folder icon on the right where it says Default Images folder. Then, go to your newly created site directory, open it, create a new folder called images and select that as your default folder. 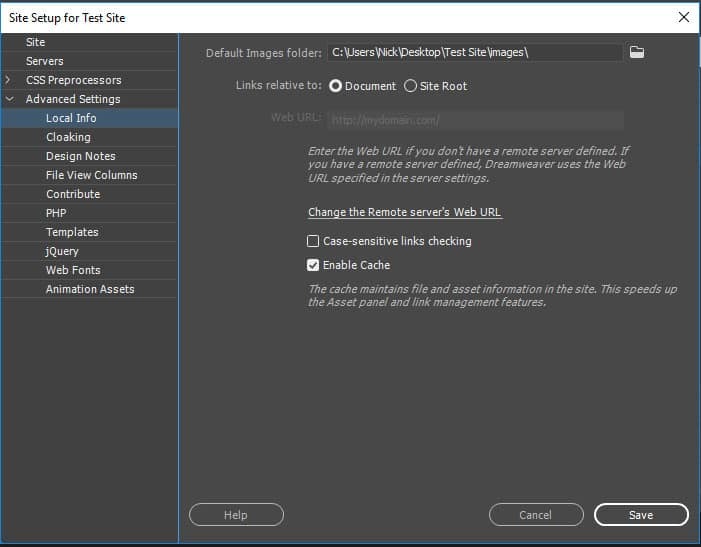 That way, Dreamweaver will save images associated with your site automatically there. That’s it for now, click Save to go back to your workspace. Now that you have created a project site, it’s time for the first file. We will start with the homepage. If Dreamweaver doesn’t offer you the option itself, go to File > New. You can either create a completely new file or use an existing template. The program comes with a few of those (see Starter Templates). Right now, we will create a new one instead. 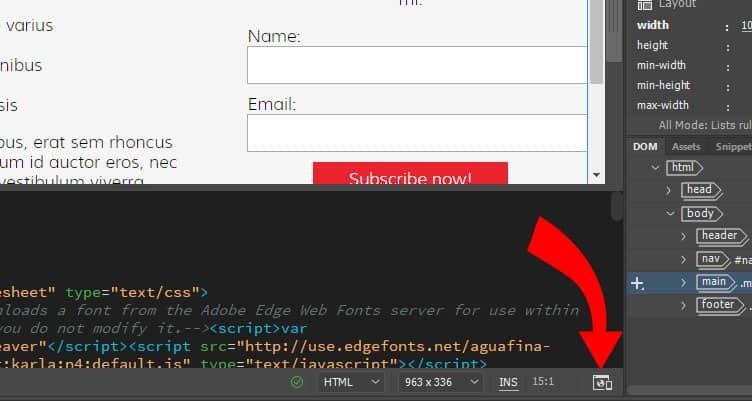 HTML is set by default and you can leave that as is. For document title, input index.html and choose Create. This will get you on the following screen. This is hat we mentioned in the beginning: a live view of what your site looks like (blank, at the moment) and the code behind it. 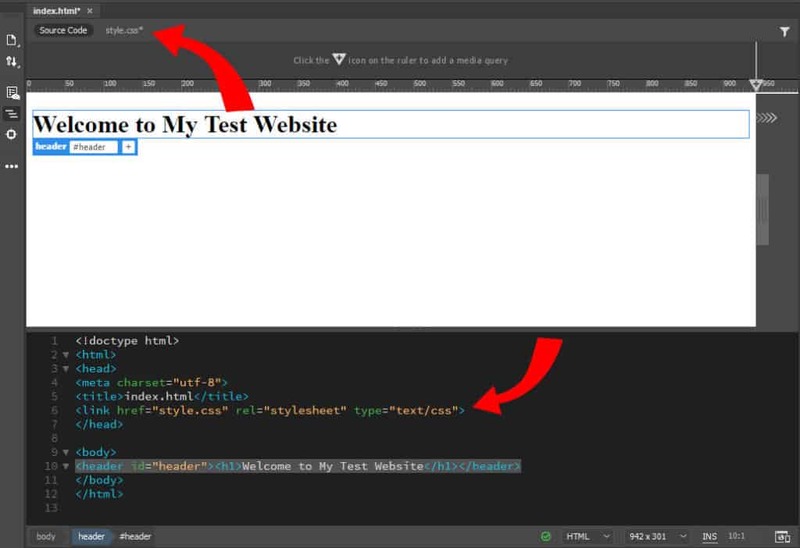 You will also notice that Dreamweaver has automatically created some basic HTML markup that you can build on. Let’s do that now, shall we? To insert an element into the page, you first need to choose its location. 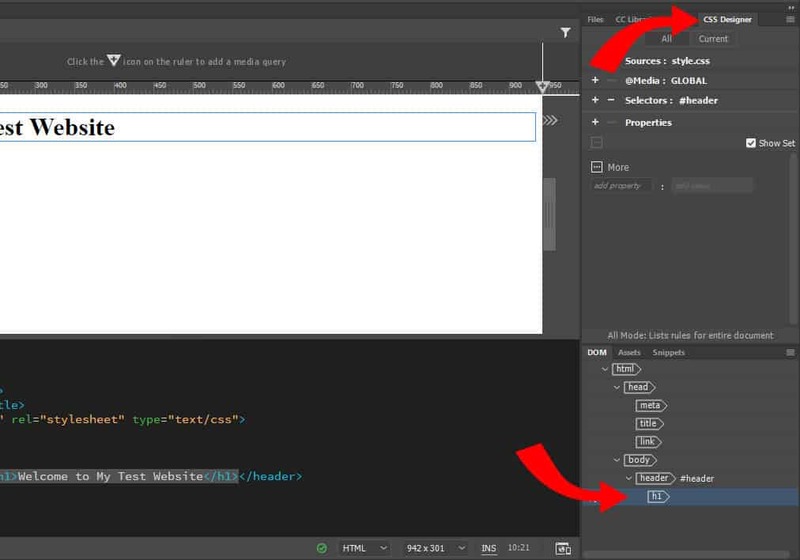 Either click on the empty page (Dreamweaver will automatically choose the <body> element if you do) or place the cursor in the same element in the code portion of the screen. After that, you need to go to the Insert tab in the upper right corner. This gives you a list of common HTML and site elements that you can add to your page. Scroll down until you can see Header as an option. A simple click inserts it into the page. You also see it appear inside the HTML document. Now you will change the text inside the header and also turn it into a heading. For both – first mark the text in the code editor at the bottom. After that, go back to Insert, click on the arrow next to Heading and choose H1. 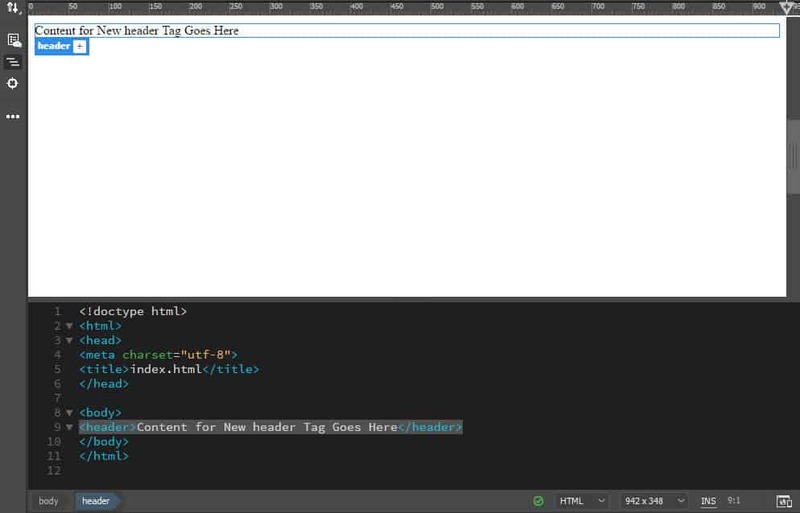 This wraps the page title into an H1 HTML tag. For more information on heading tags, read this article. After that, you can also type in a title for your page. 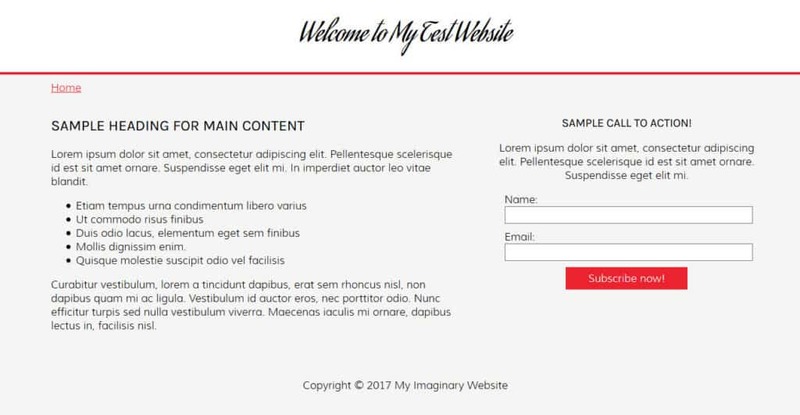 In your real website, you would choose something descriptive with keywords and not just Welcome to My Test Website as in the example. Alright, you have just created a page header! At the moment it still looks a little crude, so let’s change that via CSS next. In case you are not familiar with it, CSS is the part that provides all the styling on a web page. It allows you to define colours, dimensions of elements, font types and sizes and a hell lot more. We want to use the markup to spruce up our page title and also learn how to change CSS in Dreamweaver. Theoretically, you can add CSS right inside the HTML document. There is a lot less elegant option that what we will do, which is creating a dedicated file for all the CSS styling of the entire site. The first step is to give your new header a CSS class or id. 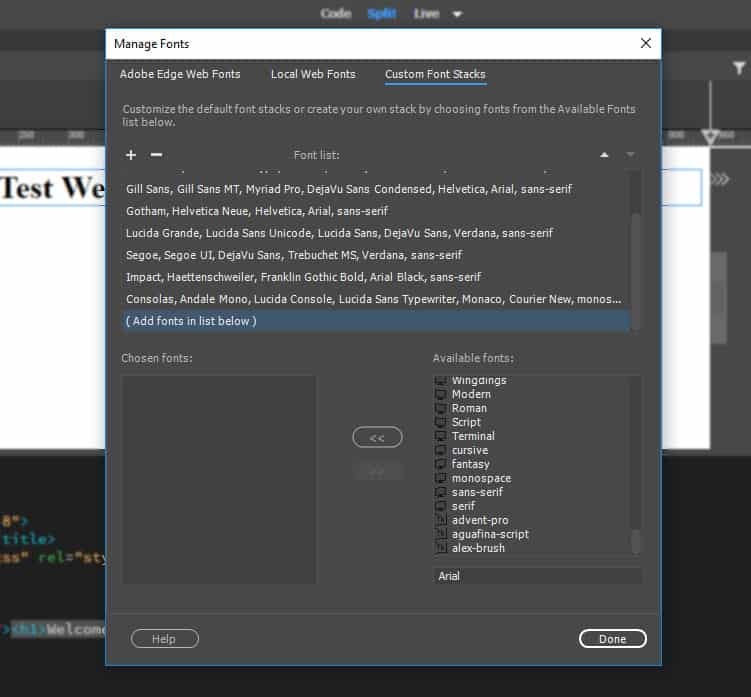 During that process, Dreamweaver will also prompt you to create a style sheet file. Go to the DOM menu in the lower right part of the screen that lists your entire site structure. Make sure your header is selected. In the live view, you will now see it marked in blue with a little label and a plus sign at the bottom. Click the plus sign and type in #header in the field that open. The hashtag means you are assigning an id as opposed to a class. Press enter. 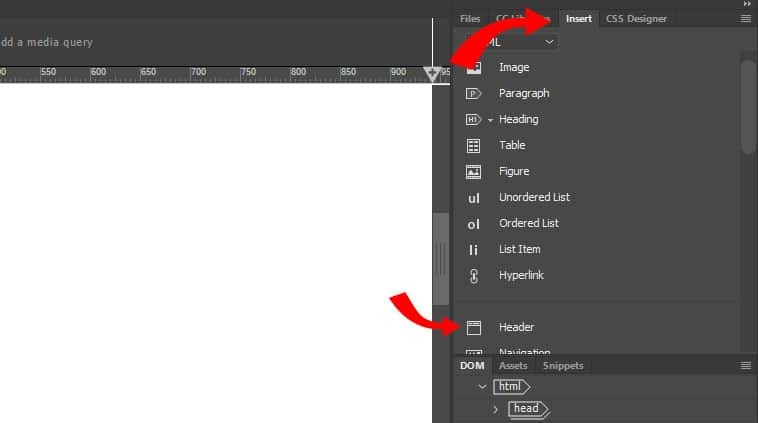 In the opening menu, instead of Define in page select Create new CSS file. In the popup, choose Browse and navigate to your site folder. Then type style.css (which is the standard name for style sheets) into the File name field and hit Save. When you now select Ok, a new file will appear at the top of your live view. You can view and edit it from there. It will also be linked to the <head> section of the HTML part of your page. Awesome possum! Now you are ready to change your page’s styling. The first thing you want to do is to change the font of your heading and also centre it. For that, you first need to create a new CSS selector. A selector is the name of an element on our page that you can assign properties to, e.g colour, size, and more. Mark your H1 heading in the DOM view on the lower right (like you did with the header before). Then, above that, choose CSS Designer. 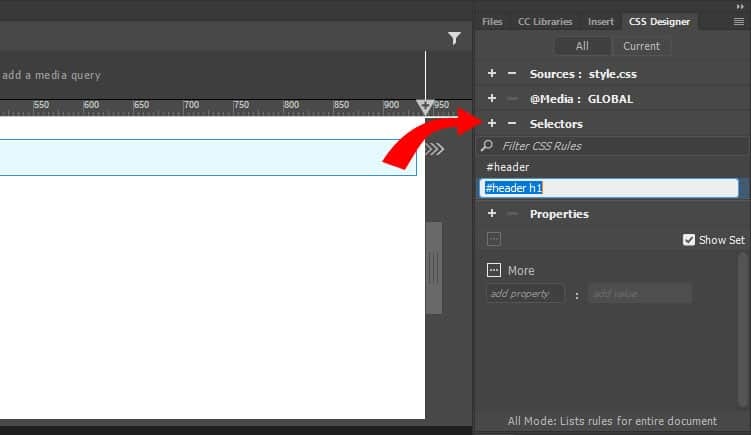 To create a CSS selector, click on the line where it says Selectors and then click on the plus symbol. This should automatically propose a selector to you named #header h1. Hit enter to create it. Done! Quick note: for all those new to CSS, this selector means that you are targeting the element named h1 inside the element called #header. That way, whatever you input as CSS is only applied to the written text only and not the header element overall. Now that you have a selector, you can assign properties to it. If you know your way around CSS, you can simply type markup into style.css and the program will automatically take care of it. For the less experienced users, Dreamweaver also makes it really easy. 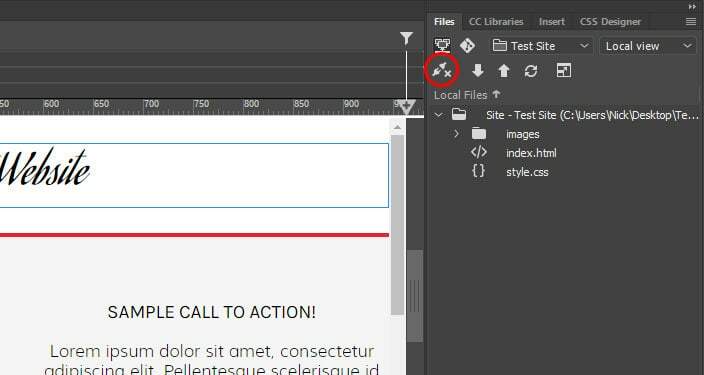 Stay in the CSS Designer menu and uncheck the box where it says Show Set. When you do, it will unlock a lot of additional options. With the new buttons, you can choose many CSS properties from the areas of layout, text, border and background. The More button gives you options to input your own rules. To change the font type, click on the Text option at the top (alternatively, scroll down). In the upcoming options, hover over font-family and click on default font. 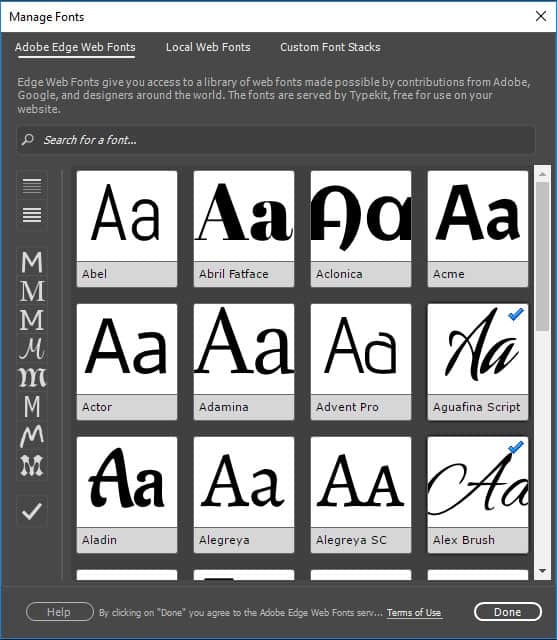 Here, you are able to choose free fonts from Adobe’s Edge Web Fonts service. Either search for a font by name or use the many filter options on the left to narrow down your choices until you find something. A click on any of the typefaces marks it for inclusion in Dreamweaver. Once you have done so, you can either use them directly or go to Custom Font Stacks to define your own fallback fonts. For now, simply hit Done and then click on default fonts again. This time pick your chosen custom font and voilá – the change is done including all the necessary coding. If you click on your style.css file at the top, you will see that all markup has been added as well. The text could still look better. The next task is to centre it and increase the font size. For that, you can also use another feature called Quick Edit. To use it, go to the code view and right click the part you want to edit. In this case, it’s on the <h1> bracket. Here, choose Quick Edit at the top. This will open the CSS associated with this element below it. Now you can input additional properties without having to search the entire style sheet file (which can be very long). In order to centre the text and make it larger, add the following code to it. 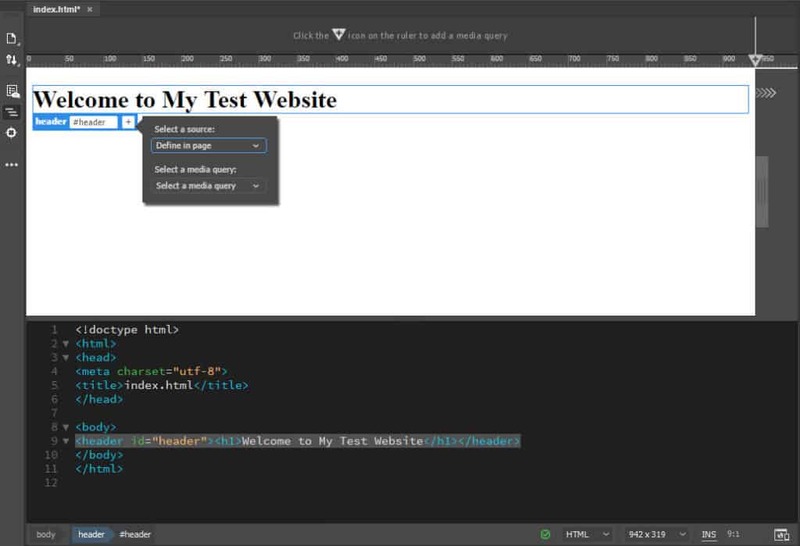 When typing, Dreamweaver will also make proposals for what you are trying to input, making it even easier. That’s the code completion feature mentioned earlier. Note that the text has already changed in the live view. Now, press Esc to leave quick edit and head over to the style sheet. You will find that the new CSS has been added in the appropriate place. By the way, if you are ever unsure about what a CSS property means, simply right-click it and choose Quick Docs (or press Ctrl+K). Dreamweaver will then give you an explanation. I want to use this as an example to show you the next steps. Even if it seems complicated, I put this together the same way I showed you before. How did I do all of this? Well, first of all, I am a bit more experience at building websites than you probably are. Therefore, I already have the steps in my mind on how to create a proper web page. Secondly, I am using a very useful feature that helps me speed up the process: Browser preview. 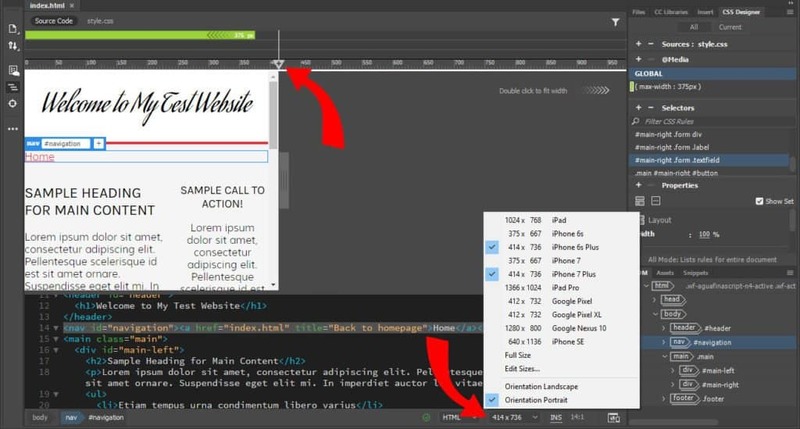 Dreamweaver allows you to view your web pages in real time in a browser and even on mobile devices. To get started, click the real-time preview button in the lower right corner. This will open the preview options. 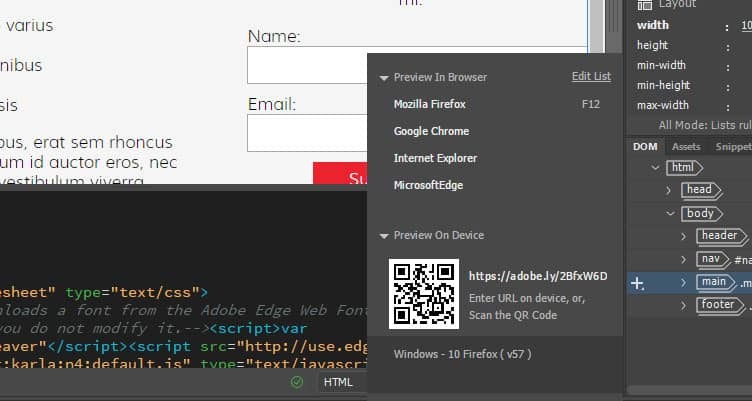 A click on one of the browser names will open your website project in it. You can also scan the QR code with your phone or tablet (for example with Firefox Quantum) or type the displayed address into your browser to start the live preview on your device. Just be aware, that you need to input your Adobe ID and password for that. You should have that from signing up for Dreamweaver. The best part: Any changes you make in Dreamweaver will automatically show up in the browser at the same time you make them. How did this help me put together site faster? First of all, depending on the size of your screen, the display in the browser might be closer to the original than what you see in Dreamweaver. Secondly, checking the site in the browser allows me to use the developer tools to test changes. They are very similar to what you see in Dreamweaver. They are more familiar to me so I can work faster with them and just copy and paste the code into my style sheet. A look at the phone version shows that there is still a lot of work to do. This brings us right to our next point. 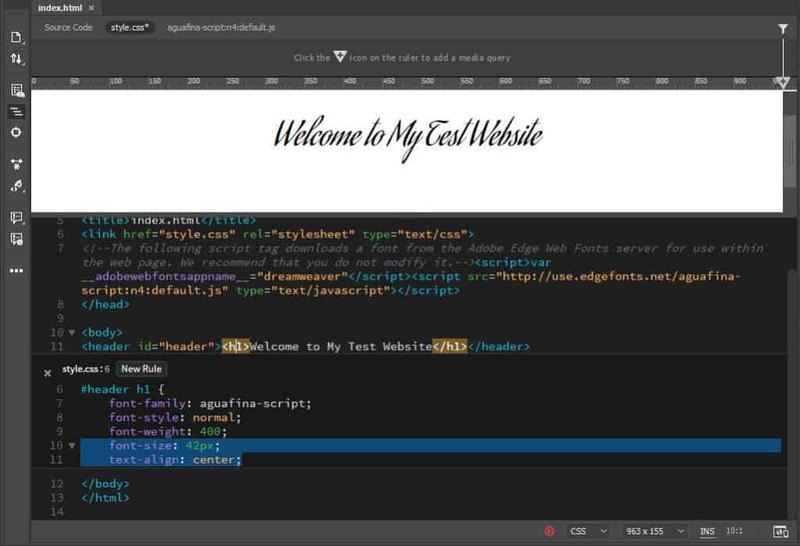 In order to make your website work on all devices, you need to add a so-called media queries. These are conditional CSS statements that tell browsers to apply styling only above or below certain screens sizes or on particular devices. That way, you can change the layout on smaller screens. So far, you have only defined global styles. That means the styles that are applied to the entire site. Now you will learn how to add conditional styles for smaller screens. First, go to CSS Designer. Make sure that the file you want to add code to is selected under Sources. 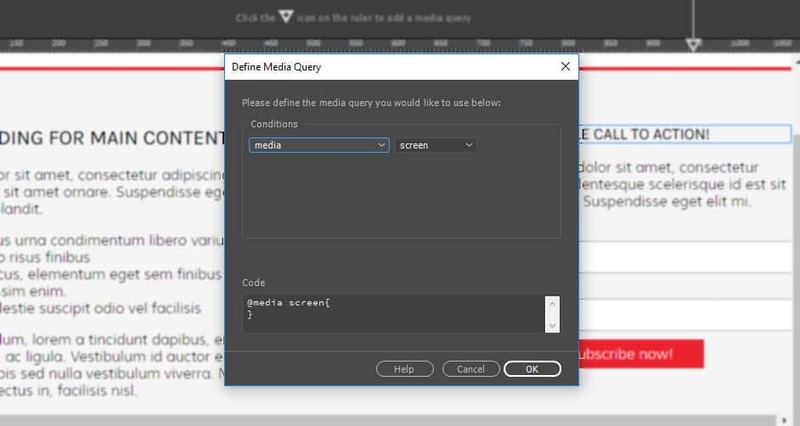 Hit the plus sign under @media. You can define conditions for media queries e.g the devices they apply to, orientation, resolution and much more. You can also add multiple conditions with the plus sign. What’s more important for our example is the max-width setting. With that, you are able to define custom CSS that will only apply to a certain max screen size. Let’s say you want to fix things on the phone first, so you type in a max-width of 375 pixels. When you do, you can see the CSS code at the bottom. What’s also going to happen when you click Ok is that a green line appears at the top of the screen. This visually represents the media query. Click it and the screen automatically jumps to that size. 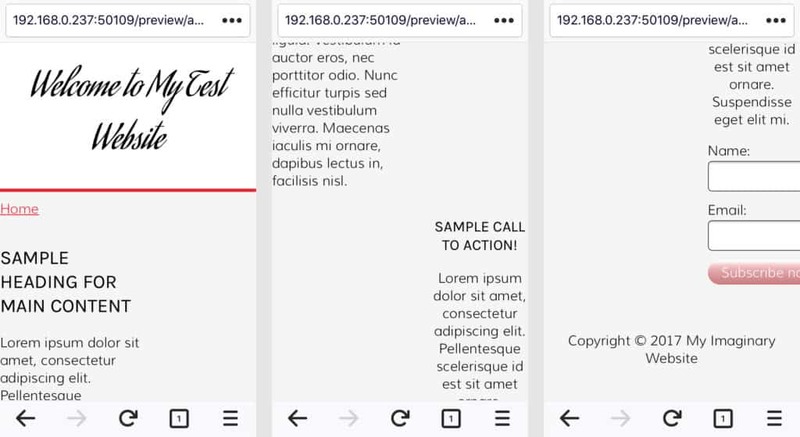 To correct the design for mobile, the first thing we need to do is eliminating the code that makes the two elements on the site arrange themselves next to one another. There clearly isn’t enough space for that. You can do this the same way you manipulated CSS before, only this time you have a media query activated while you do so. First of all – navigate to the element in your DOM view. From there create a new CSS selector for it. Then, set its width to auto, float to none (to stop it from going left) and add some padding to the sides so that the content doesn’t border on the edge of the screen. Looks much better, doesn’t it? In the same way, you can change the CSS of all other elements on the page to make them all look right. That’s basically it for media queries. You can use the same method to adjust the layout to tablets and other sizes. Pro tip: Don’t optimize for certain devices and their sizes, instead create media queries depending on the layout. That means playing with the screen size and adding queries at those points when the layout doesn’t look good anymore. One more thing: You can also create media queries a little more easily by using the pre-set device sizes in the bottom corner and clicking on the plus symbol on top when you have found a point where you want to add one. Once you are done with the design part, you are pretty much ready to upload the site to your server. As mentioned at the very beginning, Dreamweaver also makes this very easy. If you don’t have a server/web host yet, consider choosing the best web hosting. First, go to Site > Manage Sites. Select your current website from the menu and choose Edit at the bottom left. In the following window, click on Servers. Input all important data to connect to your FTP server. The name is up to you, the rest (FTP address, username, password) comes from your hosting provider. Don’t forget to specify which directory to place the files in and the web address of your live site! The last part is important so that Dreamweaver can create site-relative internal links. Under Advanced you have some more options (whether to upload files automatically upon save). You can usually keep things as they are. Hit Save twice and you are done. Once the connection is established, select the files you want to upload and click the upward-pointing arrow to do so. Once its done, your site should be available from your web address. Well done! You just built and uploaded a simple site with Dreamweaver! Dreamweaver is a fantastic program to build websites. 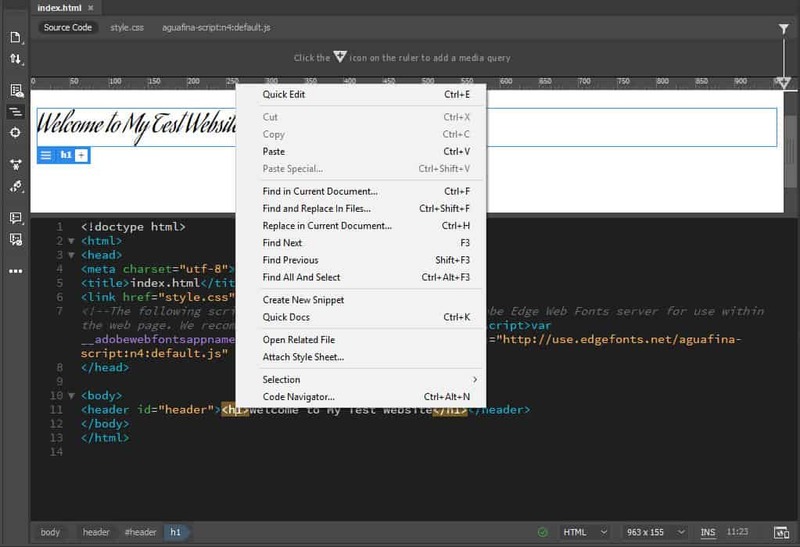 It combines an intuitive user interface with a full-fledged code editor. Through this mix, it makes it easy for beginners, intermediates and advanced users alike to build high-quality websites. In this Dreamweaver tutorial for beginners, we have introduced you to Dreamweaver and its capabilities. We have shown you how to set up the program and get started with your first site. You have learned how to create a basic HTML structure and style it with CSS. We also went over how to make a website mobile responsive and upload it onto your server. By now you have a solid understanding of how Dreamweaver works and how you can use it to make a website. Now it’s up to you to dive deeper and figure out the next steps. Don’t forget: Dreamweaver is just one way to make a website. There are many more and you can find a lot of information on that right here. Good luck! Have you used Dreamweaver before? What is your opinion? Anything to add to the above? Let us know in the comments section below! Thank you so much for this awesome tutorial. I’m taking a class on Dreamweaver and I was completely lost until I stumbled on your tutorial. You’ve explained everything how it’s done and mostly why. I appreciate the ‘why’ part a lot as I am someone who needs to understand the purpose of any action otherwise it’s just too abstract and makes no sense to me. I’m a Graphic Designing first year student, and I’m really confused on what I should be setting the website size as. Also, the gif that I have set as the background, either exceeds the screen when I preview the work, or they end up becoming too small and repeating mutiple times on screen. Thank you for such an easy to follow beginners guide. I’ve been looking for something like this since being thrown in the deep end to teach a high school ICT class about the basics of Dreamweaver. You’re a lifesaver! OLD school here (started my recently retired computer career in 1988, LONG before the commercial internet . (LONG LOVE DOS 5.0/Windows 3.11! lol). Hadn’t used DW in any way, yet up and running in probably 30 minutes. Keep up the great work. Kudos to you! I also remember the time of DOS, Norton Commander and Win 3.11. Happy you got your start with Dreamweaver. Thanks for leaving a comment! GLAD YOU LIKE IT CAROLINE! WHY ARE WE YELLING!? 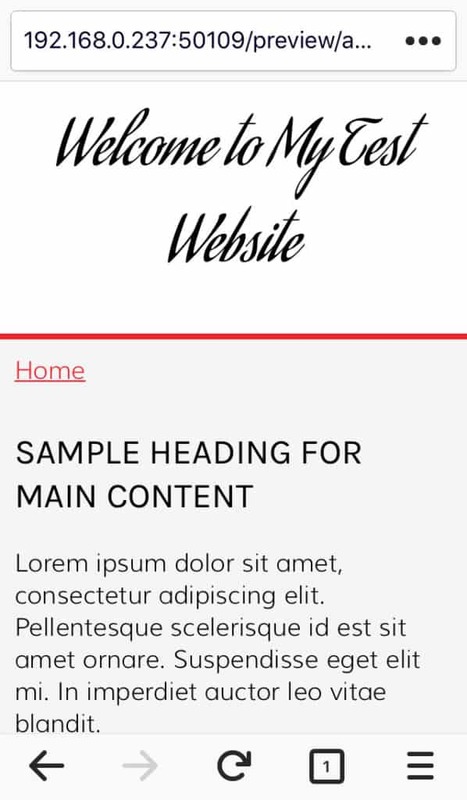 How can make the header is different php (header.php) and blog title is logo in top left with menu in top right. Hey there, unfortunately I don’t have experience doing that. Which part are you struggling with exactly? 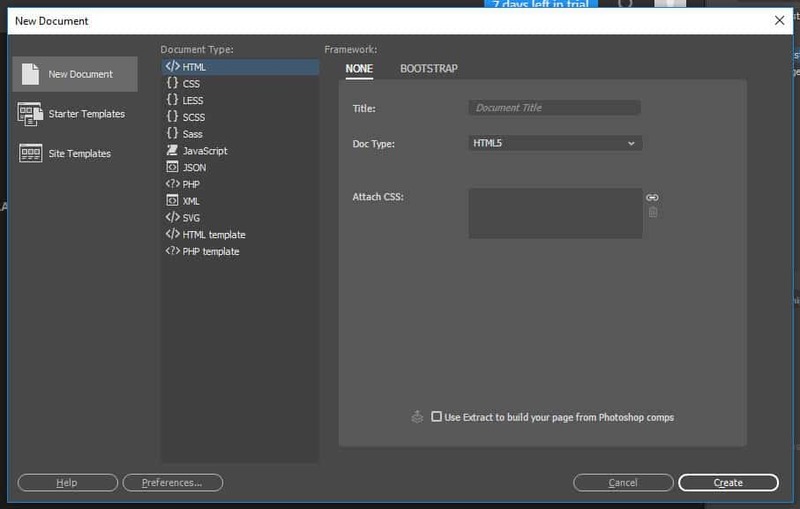 how to create a menu with dreamweaver 8 ? I’m lost! Helpe me ! Hey there, I created a navigation menu via the “Insert” menu the same way the tutorial shows it for the header. Is that what you are looking for? did you mean too? or linked to ? Adam, thanks for the input. It’s meant to be “linked to”. Could you please elaborate where you see the mistake? Cheers! Thank you a lot, Nick, for this very good introdution! Since Muse is ending, I will dive into DW now. Hey Martin, happy to help! 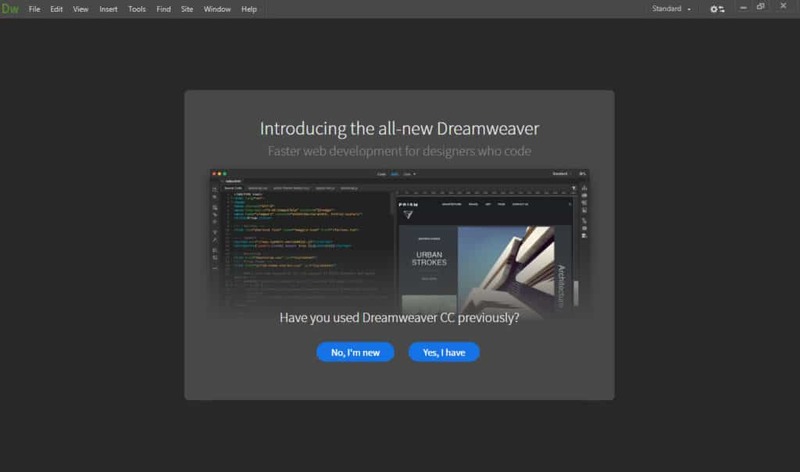 I hope you will be satisfied with Dreamweaver. Come back later to tell us how it went. Cheers!